Tongue Bay offers a secure anchorage in the right conditions. 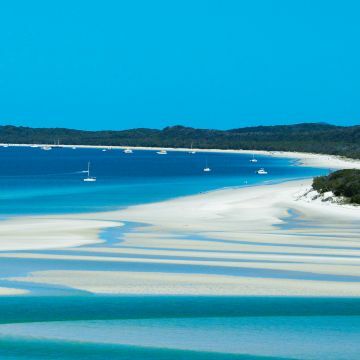 From here you can enjoy the bushwalk up to the famous Hill Inlet Lookout, which looks south down the spectacular Whitehaven Beach. Beach only accessible at low tide, take care with your plans. Best done at low tide. The walk up to the lookout is only about 700m one way and a gentle gradient. Turn off down to Lookout Beach and walk on the sands of Hill Inlet.